Well, where to start? What's not to like about fudge? 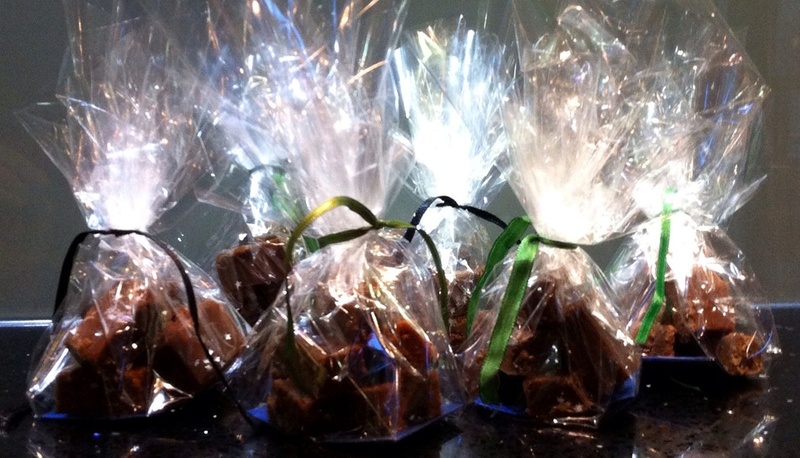 And homemade fudge has bells on (well not literally) and would make a great homemade gift. It's easy to make, has few ingredients, looks impressive and... am I selling it to you yet? Following a conversation on twitter last week with Life is Delicious (@LIDelicio) I was convinced that making fudge was something I should try. It was the Christmas pudding flavours that drew me in, that and the simplicity of the recipe. Take a look for yourself - here's a link to Life is Delicious' Christmas Pudding Fudge. So with the sultanas, currants and raisins soaking in some bourbon (MOH is liberally feeding brandy to our Christmas puddings so I wasn't going to interfere with that, and our bottle of dark rum from Barbados last year, isn't opened yet) I weighed out the sugar and butter and added this to the evaporated milk and started to stir. I don't have a sugar thermometer and boiled the fudgey liquid for ten minutes, before attempting the 'soft ball' test described in the recipe. Having not made fudge before I wasn't sure if mine was right or not - I gave it a few moments more and then decided to move on to the next stage of leaving it to cool without stirring for 5 minutes, which was harder than I expected it to be! Adding the fruit, spices and the remains of the bourbon I poured it into my prepared tin and wondered if it would set. I added some of my edible starry glitter at this stage as I wanted it to set alongside the fudge. And do you know what? That tin of evaporated milk I found, well it was a large one so because I loved the first batch so much and because it was so easy to make I made another batch. This time I altered the recipe slightly replacing white chocolate for the dark chocolate, glacé cherries for the fruit and some white rum for the va va voom! I'm also trying to think what other flavours I could make, what's your favourite fudge flavour? You see I really do love this homemade fudge (even now I've seen what's in it! ) so thanks @LIDelicio for sharing your Christmas Pudding Fudge recipe.